All of us want to live a healthy life. We know that “Health is Wealth”. A healthy mind dwells only in a healthy body. Most of our food is made of these things. We get food from plants and animals. Depending on what grows easily at which place, different things are eaten at different places. We not only eat different things but we also use the same things to prepare a variety of food items. Sometimes, we may not really have all this variety in our meals. If we are travelling, we may eat whatever is available on the way. It may not be possible for some of us, to eat such a variety of items, most of the time. Let us talk about those things that we do eat. Put on the things that you eat often. rice ,wheat ,barley oats, maize millet kappa (tapioca) ragi. We know that each dish is usually made up of one or more ingredients, which we get from plants or animals. These ingredients contain some components that are needed by our body. These components are called nutrients. The major nutrients in our food are named carbohydrates, proteins, fats, vitamins and minerals. In addition, food contains dietary fibres and water which are also needed by our body. What is the real purpose of eating food? Is it only taste or in any reasons behind it? Food helps us to grow, to give energy, to be healthy. These useful substances in food that provide you all these three are called Nutrients.They are different types nutrients are present in food we can also call them components of food. Carbohydrates and fats gives us energy to work and play. Rice, wheat, sweet potato, pluses, sugar, bananas have plentsy of carbohydrates. Proteins help us to grow and to build and repair the worn out cells in our body. Proteins helps in healing small wounds and cuts. There are called Body building food. These food items are rich in proteins. Fats are found in oil, ghee, nuts and cheese. They us more energy than carbohydrates and also keep our body warm. Fats stored food in our body. Excess of fat food contains –obesity. Who will protect our body from enemies? Do you know a type Nutritious food that protect our body from enemies. Vitamins and Minerals. Vitamins help in protecting our body against diseases. They also keep our eyes, bones teeth and gums healthy. Our body needs vitamin A, B, C, D.
Vitamin A keeps our skin and eyes healthy. Vitamin C helps body to fight against many diseases. Vitamin D helps our body to use calcium for bones and teeth. Minerals are required in small amounts in our body. They are essential for proper growth of body and for maintaining good health. Each one is essential Besides these nutrients, our body needs dietary fibres and water. Dietary fibres are also known as roughage. Roughage is mainly provided by plant products in our foods. Whole grains and pulses, potatoes, fresh fruits and vegetables are main sources of roughage. Roughage does not provide any nutrient to our body, but is an essential component of our food and adds to its bulk. This helps our body get rid of undigested food. Plants foods contain a lot of fibre or roughage that helps to get rid of waste from the body. 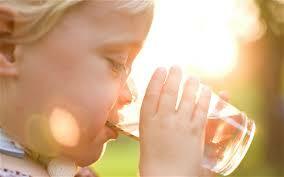 Water helps our body to absorb nutrients from food. It also helps in throwing out some wastes from body as urine and sweat. Normally, we get most of the water that our body needs from the liquids we drink — such as water, milk and tea. The food we normally eat in a day is our diet. For growth and maintenance of good health, our diet should have all the nutrients that our body needs, in right quantities. Not too much of one and not too little of the other. The diet should also contain a good amount of roughage and water. Such a diet is called a balanced diet. Pulses, groundnut, soybean, sprouted seeds (moong and Bengal gram), fermented foods. South Indian foods such as idlis, a combination of flours (missi roti, thepla made from cereals and pulses), banana, spinach, sattu, jaggery, available vegetables and other such foods provide many nutrients. Therefore, one can eat a balanced diet without expensive food materials. Eating the right kind of food is not enough. It should also be cooked properly so that its nutrients are not lost. Are you aware that some nutrients get lost in the process of cooking and preparations? may result in the loss of some vitamins. The skins of many vegetables and fruits contain vitamins and minerals. Similarly, repeated washing of rice and pulses may remove some vitamins and minerals present in them. We all know that cooking improves the taste of food and makes it easier to digest. At the same time, cooking also results in the loss of certain nutrients. Many useful proteins and considerable amounts of minerals are lost if excess water is used during cooking and is then thrown away. Vitamin C gets easily destroyed by heat during cooking. Would it not be sensible to include some fruits and raw vegetables in our diet?